Having a baby that requires special medical attention can be very stressful for parents. As part of the Fetal and Neonatal Institute, the Division of Neonatology offers an integrated team that provides compassionate, advanced, evidence-based care for critically ill newborns and infants. At our hospital, your infant will have access to state-of-the-art diagnostic and treatment services, consultations from virtually all existing pediatric subspecialties, and compassionate care provided by a world-class education and training center on the leading-edge of neonatal and perinatal research. In the Steven & Alexandra Cohen Foundation Newborn and Infant Critical Care Unit at Children's Hospital Los Angeles, your infant will have access to: Level IV, state-of-the-art diagnostic and treatment services, consultations from faculty of virtually all existing pediatric subspecialties, and compassionate care provided by a world-class education and training center on the cutting-edge of neonatal and perinatal research. 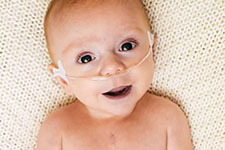 The Fetal and Neonatal Institute houses one of California’s largest Extracorporeal Membrane Oxygenation (ECMO) programs. 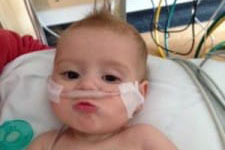 More than 1,000 children have received life-saving ECMO care at Children's Hospital Los Angeles. The Institute is the recipient of the Extracorporeal Life Support Organization (ESLO) Award for Excellence in life support, exceeding all of the requirements for receiving the award. This heart-lung bypass system takes over circulatory and respiratory functions in infants whose systems fail due to underlying acquired or congenital conditions. ECMO, considered a “last resort” treatment, improves the chances for survival, in many cases up to 80 percent. It is important to remember that only neonates with a gestational age of greater than 34 weeks are eligible for ECMO, due to the increased risk of complications in the less mature patient population. Due to the complexity of the technique and the severity of the condition of the babies requiring ECMO support, there are two ECMO nurse specialists at the bedside of infants receiving ECMO 24 hours a day and seven days a week. These specialists work under the close supervision of the neonatologists, pediatric surgeons and neonatal and surgical fellows. Initiated in 1987, the ECMO Program at our hospital has cared for more than 650 newborns supported with ECMO. The program has remained the largest referral center in Southern California and surrounding states for the treatment of neonatal conditions requiring ECMO support. The Fetal Maternal Center is a unique center among its peers in the nation. 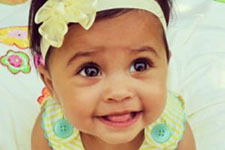 It is one of only a handful of comprehensive fetal and maternal diagnostic and treatment centers in the United States. Read more. This tertiary center provides care for high acuity patients. There are 13-20 ventilators at all times and around 25 ECMO runs every year. The CHLA Department of Surgery performs over 15,400 surgical procedures annually for children ranging in age from newborns to adolescents. Often, the procedures we provide are more complex than those at any other hospital in Southern California. Learn more about the department. The Steven & Alexandra Cohen Foundation Newborn and Infant Critical Care Unit is a state-of-the-art 58-bed intensive care unit designed to address the needs of critically ill infants. Learn more. The purpose of this program is to train neonatal-perinatal fellows and attending neonatologists the technique of performing “functional echocardiography”¹ to evaluate cardiac function during neonatal period in infants with normal cardiac structure. Although being competent at performing functional echocardiography requires the acquisition of skills to differentiate normal cardiac anatomy from abnormal cardiac structure, completion of this training does not prepare the trainees to diagnose congenital (structural) heart disease¹, ². To obtain skills to diagnose congenital (structural) heart disease one needs to complete fellowship training in pediatric cardiology. Rather, skills expected to be achieved by completion of the functional echocardiography training include the ability to identify the presence, size and clinical significance of a patent ductus arteriosus (PDA) in premature neonates, recognize the presence of hypertrophic cardiomyopathy in infants of diabetic mothers, etc (see fECHO curriculum). Accordingly, throughout the training, the need for immediate consultation with pediatric cardiologist in case of a suspicion of the presence of congenital cardiac defects on clinical, laboratory or echocardiagraphic evidence is emphasized. In addition, within the clinical structure of the USC Division of Neonatal Medicine, any infant being followed by fECHO requires a clearance from a pediatric cardiologist ensuring the absence of congenital structural cardiac anomalies. This is the only structured program in the US and around the world providing training in a novel area of point-of-care hemodynamic testing in a comprehensive manner using both didactic and direct, one-on-one educational activities. The clinical and research experience of the members if the division in the area of developmental cardiovascular physiology and diseases combined with novel bedside monitoring of cardiovascular function using ultrasound, near-infrared spectroscopy, magnetic resonance imaging and other technologies enables us to provide unique clinical services for patients with cardiovascular compromise such as seen in neonatal shock of different etiologies or with persistent pulmonary hypertension of the neonate, patent ductus arteriosus and abnormal hemodynamic transition of preterm and term neonates after birth. Children's Hospital Los Angeles and the Center of Fetal and Neonatal Medicine are in the process of developing and implementing a virtual neonatal intensive care unit (vNICU) structure that allows for the delivery of highly specialized neonatal and perinatal care to patients located far away from our hospital. Virtual medicine presents opportunities for patients to receive specialized care even while they are in remote locations far from medical experts and care specialists. In many cases, the ability to deliver care virtually allows patients in highly fragile conditions the option of foregoing a transfer from one hospital to another. It can also allow high quality care to be made available to patients in rural or remote locations. Our vNICU will initially link two sites, with the long-term goal of establishing a network of hospital NICUs across Southern California, connected via telemedicine. Given the national shortage in neonatologists, a vNICU network would allow specialists at our hospital to address the gaps in care experienced at remote hospitals and clinics. Research on telemedicine delivery has indicated that it enhances care and health outcomes for adult patients. However, as no data exist for the neonatal patient population, the neonatologists at our Center and hospital have set out to ensure that telemedicine represents the very best choice for infants and neonates prior to fully implementing the vNICU network. With generous support from the UniHealth Foundation, the Division of Neonatal Medicine is engaged in a multi-year study, researching whether the use of telemedicine in a NICU environment results in care that is safe, effective, and provides the best standard of practice. Data for the first phase of the research has been published and plans for two additional phases are in place. Phase one results indicate that the use of a remote-controlled, robotic telemedicine system in a NICU is feasible and safe. Telemedicine technology aptly provides off-site neonatologists with direct visual and auditory information about the patient and the clinical scenario in real-time in order to facilitate decisions about clinical care. Although telemedicine has proven to be an effective method of bringing the expertise of pediatric and adult intensive care specialists to underserved communities, this technology has not yet been formally studied for use in the fragile neonatal population. Once our research has been completed, we plan to develop the world’s first v-NICU program that will reach distant and underserved NICUs. Plans are already underway for providing care in Antelope Valley, where our team will supply the expertise of a Regional Level IV Care Center. Plans are underway to establish a vNICU system for providing care in more remote regions in Southern California. Under the supervision of a neonatology attending and a neonatology fellow, your baby’s day-to-day care in our Newborn and Infant Critical Care Unit (NICCU) may be provided by one of our Neonatal Nurse Practitioners. We recognize the enormous potential of technology in our field, especially when tapped for research, clinical, educational and training purposes. Initial work resulted in the building, expansion, and cataloguing of the division's intellectual assets. Clinicians, academicians, researchers, trainees, Neonatal and Infant Critical Care Unit staff members, ancillary staff, and parents assisted in assembling resources that are available to the public and that can be applied to neonatal research publications and neonatal grant applications. Education and training continues to be an extremely high priority of the neonatal faculty, including the continuing education of faculty members themselves through lecture profiles, evidence-based faculty-consensus clinical practice meetings, and serving as invited or key-note speakers or being in attendance at multiple national and international conferences and symposia. 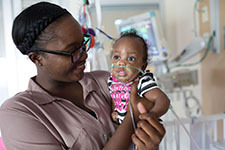 In addition, the scope of postgraduate medical and nursing education continues to broaden with structured pediatric resident neonatal intensive care unit rotations at the NICCU at Children's Hospital Los Angeles and the NICU at the LAC+USC Medical Center, training of neonatal fellows (our Neonatal Fellowship Program is the largest one in Southern California), and training sessions for neonatal nurses, respiratory therapists and ECMO specialists. All of these activities involve core academic responsibilities for the division’s faculty. Timely and thorough parent education is an integral part of the responsibilities of the faculty while providing clinical service and is fundamental in providing state-of-the-art, compassionate and family-centered clinical services at the bedsides of our tiny patients. We believe that our unwavering commitment to serve our patients and their families combined with the experience and knowledge that continues to evolve from our participation in postgraduate medical education and cutting-edge basic, translational and clinical research enables us to provide the best possible care for all critically ill neonates and infants admitted to our intensive care units. The Divisional Basic Research Program focuses on the mechanisms of lung development and inflammation as well as the pathophysiology of chronic lung disease (CLD or BPD) of the preterm neonate using state-of-the-art techniques in cellular and molecular biology and physiology. This program is directed by Parviz Minoo PhD (link). In addition, the program provides research opportunities in basic molecular and cellular biology for the neonatal-perinatal fellows in the USC Division of Neonatal Medicine through the Neonatal Fellowship Program. The program also includes postdoctoral fellows, working on various aspects of lung morphogenesis and disease. One of the major thrusts of our research program has been the elucidation of the role played by inflammation in pathogenesis of BPD in very young infants. The efforts of a number of fellows participating in the program have shown that an important mediator of lung injury, TGF-β is expressed in the lungs of premature infants with hyaline membrane disease. By using a state of the art molecular techniques, we have further demonstrated that this TGF-β is biologically active and it’s expression is correlated with the severity of the inflammatory lung disease. This is a significant finding that allows us to predict which babies may be at high risk for BPD and thus tailor specific therapeutic measures to prevent lung disease. Another important research finding pertains to the role of interleukin-10, an anti-inflammatory cytokine. Inflammatory cells from the lungs of very low birth weight neonates exhibit significantly reduced potential to activate IL-10 and hence explain the ongoing, smoldering inflammatory response that is characteristic of BPD. As a part of our studies on developmental aspects of premature lung, we are currently working on elucidation of a number of transcriptional and signaling pathways. These include the canonical and non-canonical WNT pathway and their individual components. The role of TGF-beta pathway and particularly its receptors on epithelial and mesenchymal cells in the lung is being investigated using conditional cell-type-specific gene deletion approaches. Another pathway of interest is that of sonic hedgehog. The critical role of the key transcriptional regulator, Nkx2.1 on lung gene expression is also under investigation. The basic research activities of the USC Division of Neonatal Medicine are funded by RO1 and PO1 grants from the National Institutes of Health, research grants from the American Lung Association and generous funds provided by the Hastings Foundation. 1. Studies into responses of the developmentally regulated organ system to pathological conditions and the treatment modalities. We use state-of-the art methods of translational clinical research, including but not restricted to functional echocardiography, ultrasonography, near infrared spectroscopy, MRI, amplitude-integrated EEG and pulmonary function tests. This program is built on strong collaborations among several departments and divisions, including the Departments of Radiology and Anesthesiology/Critical Care and the Heart Institute. In doing so, we help ensure translation of findings of developmental molecular, cellular and whole-animal physiology to the patient’s bedside, as well as a better understanding of applied treatment modalities. This complex research program is directed by Istvan Seri MD, PhD DHon and Rangasamy Ramanathan MD. 2. Evidence-gathering to determine that the characterization of pathological conditions is relevant to health and that the treatments we employ are associated with improved outcomes in the developing human. This evolving component will enable us to verify whether documented pathophysiological findings are useful in predicting outcomes and that our applied treatment modalities are successful both in the short- and the long run (see Epidemiology Research). This program provides guidance for neonatal fellows and other investigators interested in translational/clinical research in newborn infants including randomized clinical trials and observational or interventional research activities. We provide technical as well as basic research skills and create opportunities for growth and leadership through exposure/collaboration with other researchers in both clinical and bench research settings. This program provides guidance for neonatal fellows and other investigators interested in epidemiology and outcomes research in newborn infants and is directed by Philippe Friedlich MD, MSEpi, MBA. Role of moderately early low-dose corticosteroids in preterm infants with relative adrenal insufficiency and vasopressor-resistant hypotension. Research into developmental pulmonary physiology, pulmonary function and disease pathophysiology entails a large number of testing procedures. These measurements include pulmonary mechanics, gas exchange, and computerized pulse oximetry in newborn infants breathing spontaneously or infants receiving assisted ventilation. The list of parameters thus determined includes tidal volume, minute ventilation, CO2 sensitivity, dynamic lung compliance, respiratory system compliance, pulmonary resistance (total, inspiratory, expiratory), work of breathing, functional residual capacity, peak inspiratory and expiratory flows, peak-to-peak pressure-volume and flow-volume loops, passive respiratory mechanics, computerized pulse oximetry, spectral and dynamic analysis of oxygen saturation, and end-tidal CO2. Outcomes research and quality of care benchmarking are of the utmost importance in the care of high-risk neonates as without long-term outcome data and appropriate quality control measures it is impossible to assess the value of different therapeutic interventions and approaches to provision of care. In collaboration with the Division of Research on Children, Youth and Families, the large cohort of high-risk newborns treated in our neonatal network and the mothers with high-risk pregnancies followed by our Maternal-Fetal Health Center provide a unique opportunity to perform large-scale epidemiologic and outcomes-related research studies. The Fetal and Neonatal Institute is nationally recognized for exceptional, groundbreaking care for babies and their mothers. 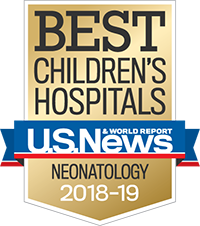 U.S. News & World Report ranked CHLA among the top hospitals in the nation for neonatology care for 2018-19. The Extracorporeal Membrane Oxygenation Program at the Newborn and Infant Critical Care Unit at CHLA was designated as a Center of Excellence by the Extracorporeal Life Support Organization. The NICCU at CHLA received the 2014 ICU Design Citation Award, which is co-sponsored by the Society of Critical Care Medicine, the American Association of Critical Care Nurses and the American Institute of Architects Academy on Architecture for Health. Lisa and Rob Knox surroung their little warrior, Tucker, who we helped overcome a rare congenital hernia condition. Read more.